A region of West Antarctica is behaving differently from most of the continent’s ice: A large patch of ice there is thickening, unlike other parts of West Antarctica that are losing ice. Whether this thickening trend will continue affects the overall amount that melting or collapsing glaciers could raise the level of the world’s oceans. A study led by the University of Washington has discovered a new clue to this region’s behavior: A volcano under the ice sheet has left an almost 6,000-year record of the glacier’s motion. The track hidden in the middle of the ice sheet suggests that the current thickening is just a short-term feature that may not affect the glacier over the long term. It also suggests that similar clues to the past may be hiding deep inside the ice sheet itself. “What’s exciting about this study is that we show how the structure of the ice sheet acts as a powerful record of what has happened in the past,” said Nicholas Holschuh, a UW postdoctoral researcher in Earth and space sciences. He is first author of the paper published Sept. 4 in The Cryosphere. 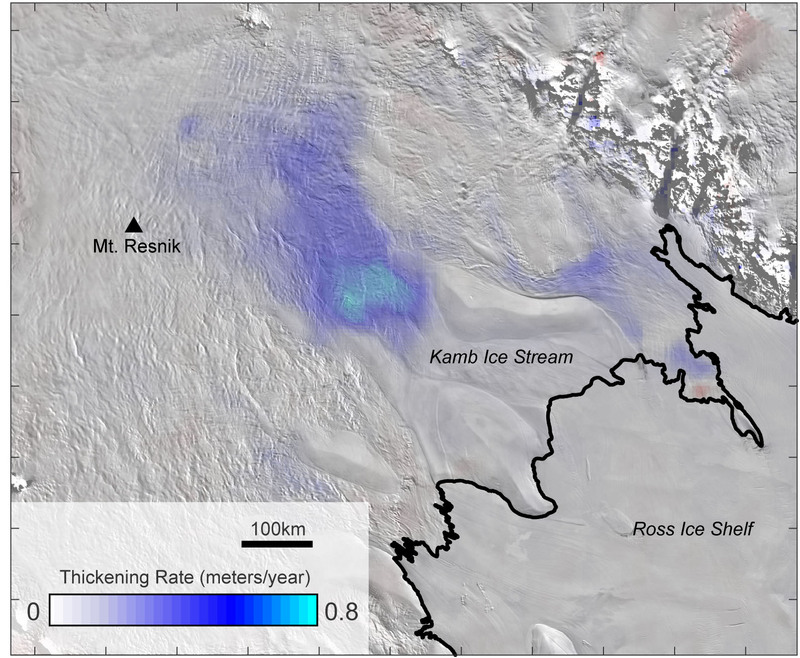 Studies show Kamb Ice Stream has flowed quickly in the past but stalled more than a century ago, leaving the region’s ice to drain via the four other major ice streams, a switch that glaciologists think happens every few hundred years. Meanwhile the ice inland of Kamb Ice Stream is beginning to bulge, and it is unclear what will happen next. 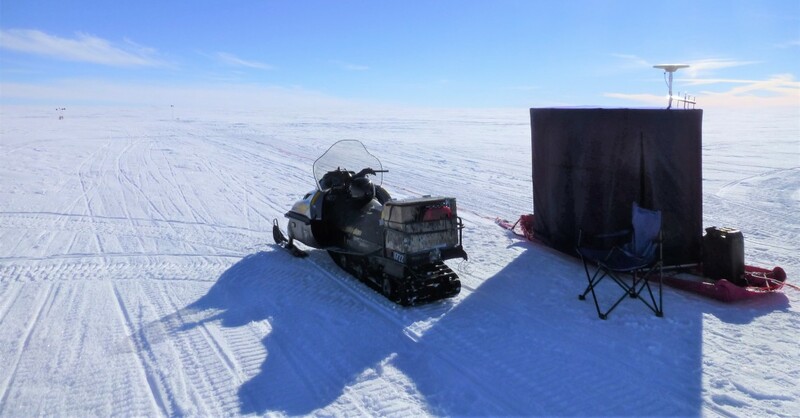 The paper analyzes two radar surveys of the area’s ice. One was collected in 2002 by co-authors Robert Jacobel and Brian Welch, using the ice-penetrating radar system at St. Olaf College in Minnesota, and the other in 2004 by co-author Howard Conway, a UW research professor of Earth and space sciences. Conway noticed the missing layers and asked his colleagues to investigate. “It wasn’t until we had spent probably six months with this data set that we started to piece together the fact that this thing that we could see within the ice sheet was forming in response to the subglacial volcano,” Holschuh said. “Despite the fact that there are all these dramatic changes at the coast, the ice flowing in the interior was not really affected,” Holschuh said. Holschuh cautions that this is only a single data point and needs confirmation from other observations. He is part of an international team of Antarctic scientists looking at combining the hundreds of radar scans of Antarctic and Greenland glaciers that were originally done to measure ice thickness. 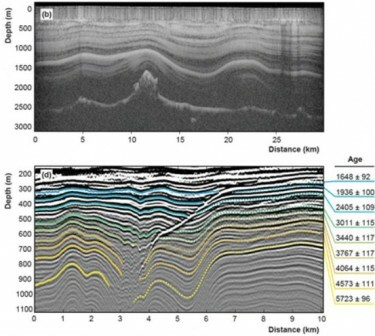 Those data may also contain unique details of the glacier’s internal structure that can be used to recreate the history of the ice sheet’s motion. For more information, contact Holschuh at holschuh@uw.edu. Images and video are available for direct download at www.bit.ly/VolcanoUnderGlacier.